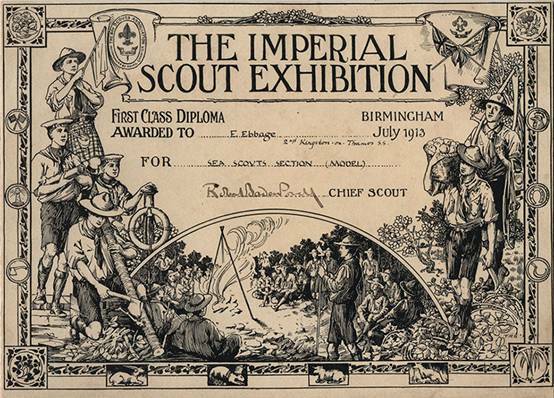 The Imperial Scout Exhibition, Rally and Sea Scout Display. Birmingham. England. 2 - 8 July 1913. 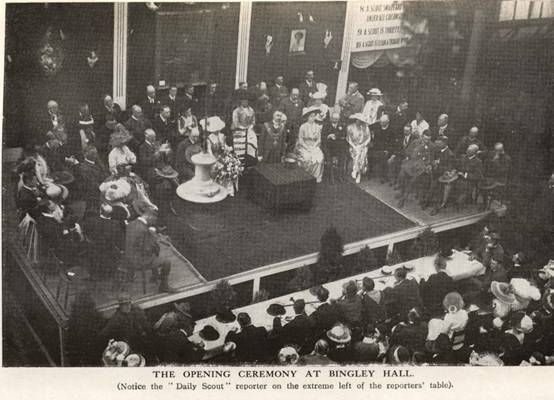 In July 1913 the Imperial Scout Exhibition was held at Bingley Hall, Birmingham. This was the first exhibition ever held on such a large scale where the whole of the work is done by the boys, illustrating the training of Boy Scouts. A pattern had already been established of holding a big Scout function every two years. There had been the Crystal Palace Rally in 1909, the Windsor Rally in 1911. Now the Association were trying out an event in the Midlands. A forerunner for the 1920 World Jamboree at Olympia. 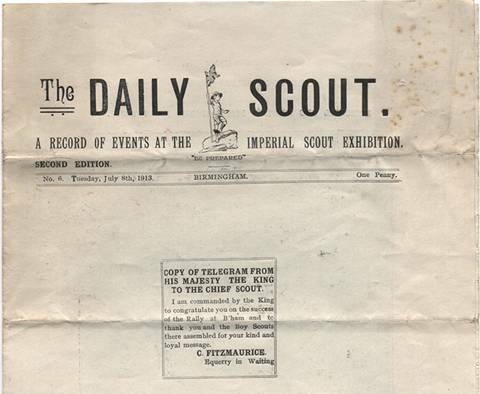 Six thousand Scouts were under canvas for a week and many thousands more, with members of the public, came in daily. Her Royal Highness Princess Alexander of Teck, accompanied by His Serene Highness Prince Alexander, opened the Exhibition at 2.30 on 2 July. Baden Powell then thanked their Royal Highnesses for opening the Exhibition. Prince Alexander, he said, was the forerunner of the Boy Scouts; for, in the days of the Matabele War, the Prince wore out his leggings, and fought the rest of the campaign with bare legs! BP then said that this exhibition was the first at which boys had received prizes for work done, not in school, but in spare time, and it showed what the Boy Scouts could do if they tried. In conclusion BP referred to the world-wide brotherhood of Scouts " a brotherhood which knows no distinction of country, class or creed." Thanks Badges were then presented to their Royal Highnesses by BP, the party then proceeded to make a tour of inspection of all the Exhibition. 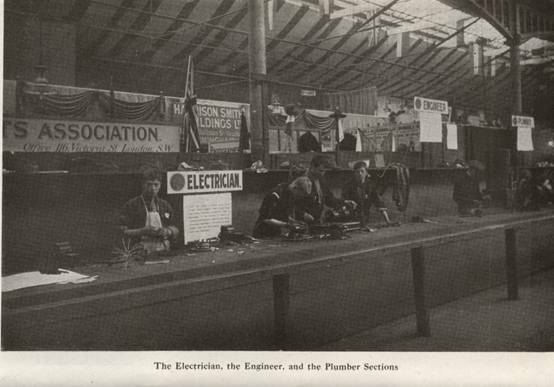 THE EXHIBITION, BINGLEY HALL. 2 - 8 July 1913. 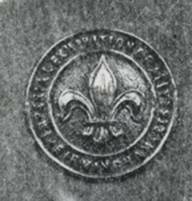 The Exhibition consisted of a series of demonstrations, exhibits and displays illustrating the Scout badges. Many useful and valuable prizes were given by newspapers, companies, societies and individuals. 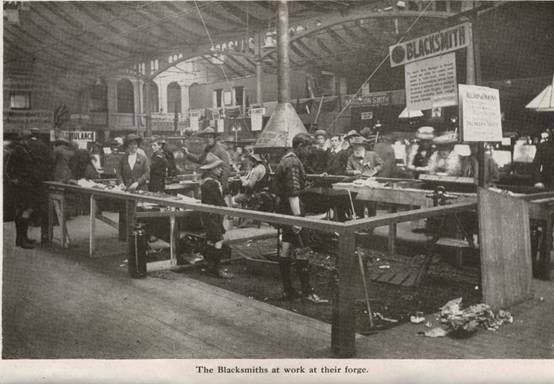 In many of the sections the winners were awarded free apprenticeships with local companies. Scout Clerks were put through their paces for the various qualifications necessary to gain the badge. Including handwriting, hand-printing, typewriting and shorthand. 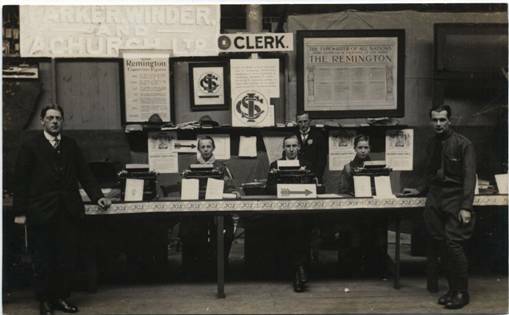 Many had made themselves quite proficient at shorthand and typewriting with a view to getting a job later on. In fact several of the Scouts were offered employment by people who had visited the Exhibition and were impressed by the smart way they worked. A prize of a two year Scholarship was also awarded. In the Blacksmiths' section was a small forge complete with anvil, hammers etc. All day long there was the musical ring of the hammer as Scouts forged horseshoes and various other useful items from red hot metal. Apprenticeship prizes were awarded to two lucky Scouts. Apprenticeship prizes were also awarded at the Airman, Electrician, Engineer, Plumber, Printer, Signaller and Sea Scouts and exhibits. At the Cook exhibit, every two hours, a patrol of Scouts were given the necessary materials to produce a meal. Hashes and stews, vegetables, pies, tarts and puddings were turned out. They then served their companions and cleaned up the kitchen ready for the next patrol to arrive. There was a exhibit by the boys from the Buckhurst Scout Farm complete with cow, where farming in all it's branches was demonstrated. 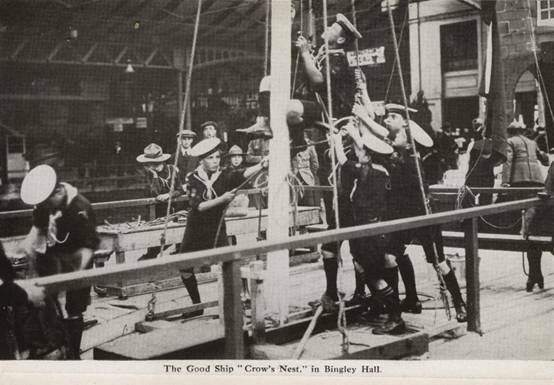 Other popular exhibits included the Fire Brigade demonstrations, Bridge building demonstrations, First Aid and Ambulance (almost 1,000 Scouts entered the Ambulance Competitions). 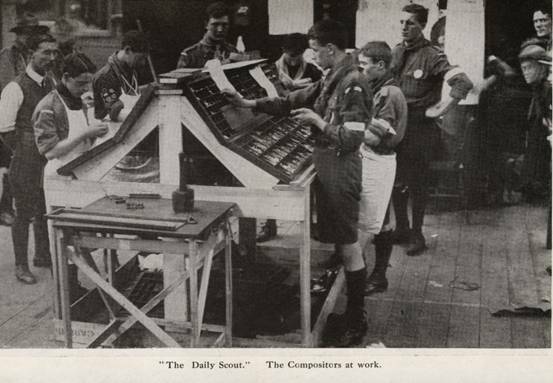 At the Printer exhibit Scouts edited, printed and sold a daily paper for one penny. Scouts used wireless communication to keep up with the latest news from the Perry Hall and Sea scout camps. Such was the success of the paper all editions sold out. 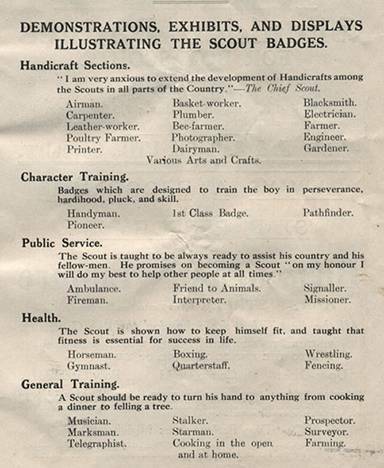 Several of the Scouts were offered jobs by local employers, after seeing the quality of their work. "There doesn't seem to be a __________thing these boys can't do," was the expression used by a working man visiting the Exhibition. His statement put into so many words the feeling of all who visited the remarkable show. It was at once an eye-opener and an inspiration. For the public it showed what Scout training means; that it is not a form of military instruction, nor is it a Sunday school. Scouting is for developing the qualities of manliness, industry, unselfishness and many other points which go to make good citizens. For those working in the movement the Exhibition exceeded all their expectations, showing what boys are capable of doing if they are given the ambition. To the Scouts themselves it revealed the fact that they are not only members of a numerous brotherhood, but also of a band of clever craftsmen. CANADA, AUSTRALIA, SOUTH AFRICA, INDIA, GIBRALTER, STRAITS SETTLEMENTS, CHINA, BELGIUM, FRANCE, GERMANY, POLAND, CZCHOSLOVAKIA, HUNGARY, AUSTRIA, SPAIN, NORWAY, SWEDEN, DENMARK, HOLLAND, ITALY and USA. In all 6,000 Scouts. 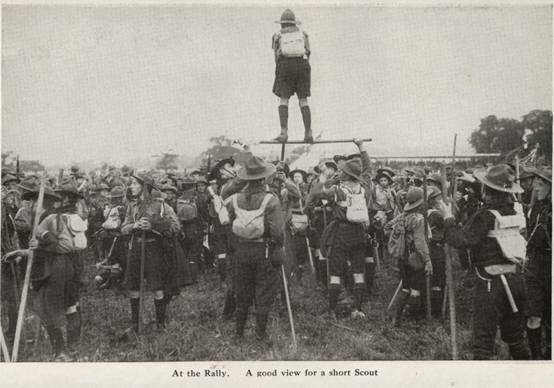 The first overseas Scouts to arrive were the Polish contingent of just over 100. The Scouts from Shanghai had journeyed six weeks to get to the Exhibition. BP said " On no other occasion in the history of the world have representatives of a Boys' Organisation gathered from so many Countries." THE SEA SCOUT DISPLAY. EDGBASTON RESERVOIR 4 July 1913. The principal feature of the display was the inspection of the Sea Scouts by Admiral Lord Charles Beresford, Chief Sea Scout accompanied by Sir Robert Baden-Powell. 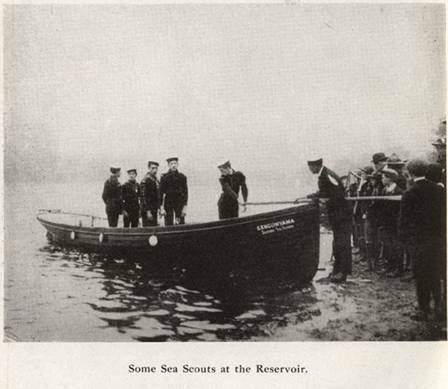 Sea Scouts from all parts of the United Kingdom assembled at the reservoir, the largest Troop being 70 boys from the Port of London Sea Scouts. The inspection of the fleet was from the motor Launch ALERT, the Scouts being in three divisions around the reservoir. After the inspection the launch took up position in the centre of the reservoir and the three divisions closed in around the Chief Scout. Charles Beresford then addressed the Sea Scouts who were clustered round in about 50 boats. Within a period of two hours the public saw ships capsize and their crews rescued by swimmers and boats. Scouts fall overboard to be promptly pulled to safety and resuscitated by first aid. Crews of sinking ships saved by the aid of rocket apparatus and breeches buoy. The programme was completed with combat for the possession of a whale. THE RALLY, PERRY HALL PARK. 5 July 1913. The Scouts at the Exhibition camped at Perry Hall Park and journeyed the two miles to Bingley Hall each day. On Saturday 5 July these Scouts were joined by other Scouts from all over the United Kingdom for a Rally and a Review by Prince Arthur of Connaught. 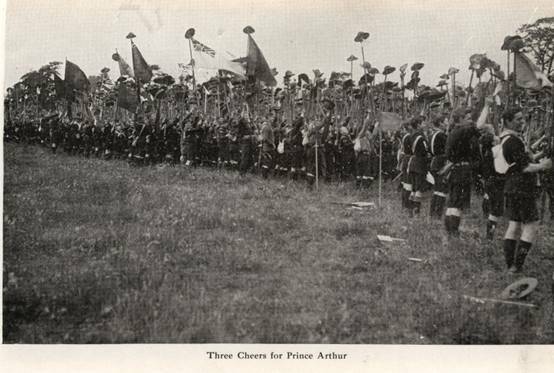 Prince Arthur and BP inspected the 25,000 Scouts. Those present in the park would not readily forget the splendid spectacle they witnessed. Shortly before three o'clock the sound of fifes and drums, of bugles, and the skirling of the pipes could be heard. From each side of the parade ground troop after troop of Scouts with banners and flags made to their positions. 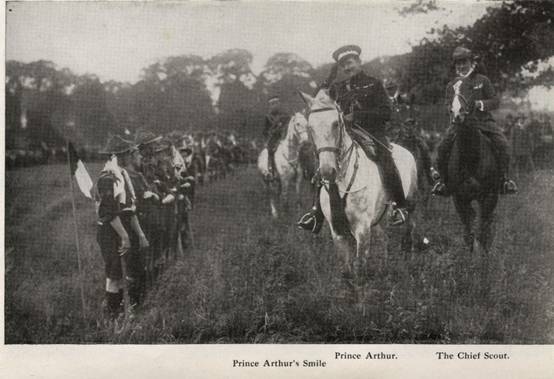 At half-past-three the Prince rode onto the parade ground accompanied by the Chief Scout. His Royal Highness first inspected the King's Scouts and Life-savers. The various divisions were then inspected, each coming to the alert and saluting. During the inspection the public were entertained by the pipers, the Rifle Brigade band and the Perthshire Scout band. After the inspection hats were doffed and raised aloft on staves, the tremendous outburst of the Scouts cheering produced a volume that had seldom if ever been heard in Birmingham before. Then came the sight of the afternoon, after three cheers for Prince Arthur, a moments silence was broken by a bugle call followed by the charge. 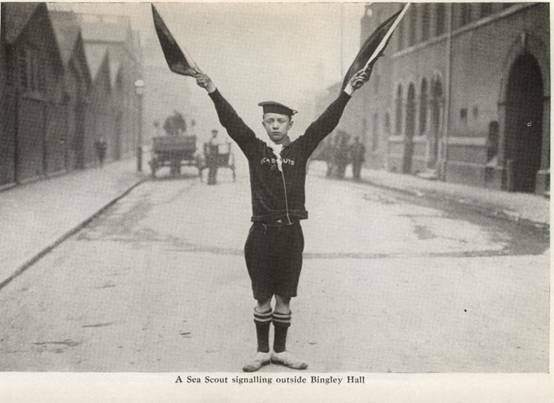 The whole parade dashed forward waving their flags and staves, while each patrol yelled their particular calls, producing an effect that will never be forgotten by those present. The following letter from the Lord Mayor of Birmingham was received by BP. Before you leave Birmingham I should like, on behalf of the citizens to express their appreciation of the excellent conduct of the Boy Scouts during their stay in the city. Considering the very large numbers attending the Rally and the Exhibition, I think it is noteworthy that no trouble of any kind occurred. In fact, the bearing of the lads is first-class testimonial to the excellent training they have received under your organisation. I trust that the gathering has met with all the success you desire.